Al Parker, reference photograph, "All the Golden Things," 1946-47. (1) How do human beings make meaning with objects, images, structures and spaces that comprise their worlds? And how do the contexts of production and use – technologies of production, status as commodities, established systems of valuation, intended users/audiences, etc. – shape these meanings? What cultural narratives, whether local or national, impinge upon their creation, reception and future meanings? Alex Ross, cover illustration, Good Housekeeping, February 1947. Detail, fiction sections, Table of Contents, GH. Table of Contents, Good Housekeeping, February 1947. A faculty reading group is taking shape this fall. One of our first activities will involve engagement with material from the Modern Graphic History Library. As faculty director of same, I have worked with curator Skye Lacerte, new project archivist Alexis Pomeroy and student researcher Eden Lewis to pull together a set of artifacts for the group to engage. I well recall the experience of beginning to work with the Al Parker collection when it arrived courtesy of Kit Parker, Al’s son, and his wife Donna. Al Parker was an extremely accomplished and well-known illustrator for periodicals whose most important work was executed between the late 1930s and the early 1960s. He worked for the Ladies Home Journal, Cosmopolitan, Collier’s and other periodicals, most famously producing a series of LHJ covers depicting a blonde mother and daughter engaged in various activities while identically costumed. The Parker Collection came to us in 2000, establishing a cornerstone of what became the Modern Graphic History Library. It consists of many original works (almost all gouache on board), reference photographs, printed tear sheets, professional correspondence, and other ephemera. As I began to work my way through the material, 90 percent of which was executed before I was born in 1960, I found myself asking: What is this stuff? How do I look at it? Let’s hold that question in abeyance, and assemble our sample set. Here’s what we have to work with: an illustration by Al Parker, a reproduction of which appeared in Good Housekeeping Magazine in February 1947. We have a tear sheet of the opening spread of the story, “All the Golden Things,” by Jack Sher, printed in four process colors (CMYK). In the manner of the period, the illustration–of a gigantic sharp-dressed man reclining, as in a chaise lounge, on a bed of palm trees along a beach–contemplating his cigar, as it were. Three attractive women’s heads appear in profile near and above his own: a redhead, a brunette and a blonde (representing, we might conclude, his current wife along with two exes). The peculiar image dominates the two page spread. We also have the reference photographs from the shoot that Parker set up with models in his studio. In addition to that, we have the whole issue of the February 1947 Good Housekeeping in a bound copy, from the Walt Reed Illustration Archive that we acquired from the Reed family last year. The magazine gives us the table of contents, as well as the succession of other stories and illustrated two-page spreads in which Parker’s picture and Sher’s story appeared. It's striking just how much fiction magazines published during these decades, and how much illustration–for adults!–was produced to accompany it. We have the visual display of the spreads, which are not illustrated, but rather are bracketed by advertisements, in several cases printed in four colors but otherwise delivered in one or two. Some ads are illustrated; all of them make use of display typography and/or hand-lettering that provide inflection to the voice of the ad. That is, we have the back-of-the-book, cheap-to-produce bill-paying section of the magazine that seeks to deliver on the promise offered by the showy narrative launch(es) up front. 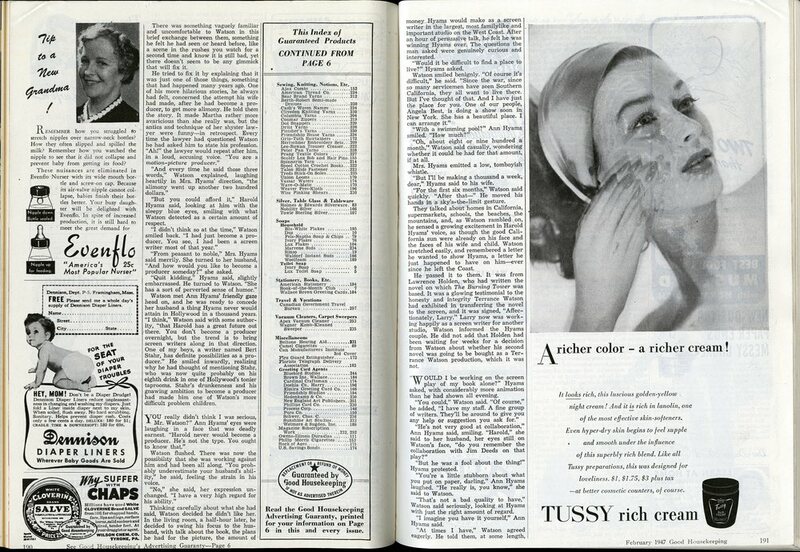 The succeeding story spreads provide a roster of period product advertisements: beauty aids, condiments, time-saving conveniences, self-improvement opportunities. I have prepared a set of ads from these spreads for closer inspection here. I will refrain from additional comment on this material, as the reading group's discussion of it promises much. Can't wait!